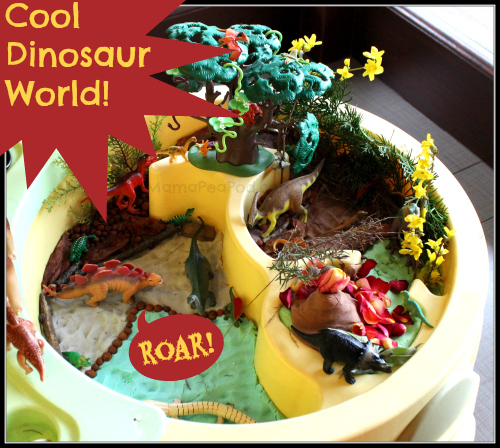 This dinosaur small world play scene was a big hit at Sweet Pea's dinosaur birthday party! The kids had so much fun playing with it, and it was really easy to set up in about 10-15 minutes with just a little preparation ahead of time. All I used was some no-cook homemade play dough and nature items collected from the garden! A few days before her party, I made several batches of no-cook homemade play dough in 'earthy' colours - shades of blue, brown, grey and green. To make the brown I first tried mixing red and green food colouring, but it made more of a greyish colour (which I used as 'rock' in our dinosaur world.) Then I found it worked much better to make brown if I just added some cocoa powder instead - and it smelled divine, too! In total, to fill our whole sensory play table [affiliate link], I made 5 batches of this no-cook homemade play dough recipe. I stored it in resealable plastic bags to keep it soft and fresh. I flattened the play dough down in sections to make different landforms - blue for a lake, grey/beige for sand/rocks, brown for mud/earth, and green for grass/forest. Then I went out to the garden and collected some bits and pieces of nature - clippings from some bushes, bits of grass, twigs, rocks, wood chips, and some flowers. 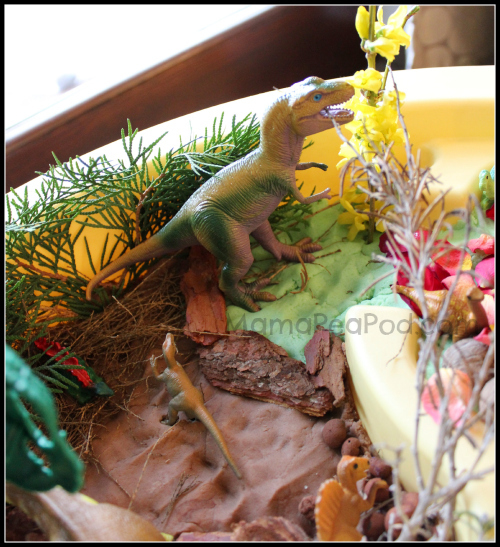 I brought them in and placed them around the dinosaur world - bush/tree clippings, grasses and flowers in the grass/forest area, wood chips and twigs around the brown parts, and rocks to section off areas. 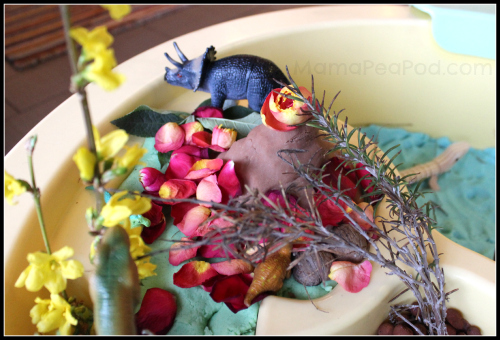 I used some brown play dough to form a volcano shape and rose buds and petals to make the red lava. Then I hid our Playmobil dinosaur set and all the dinosaur toys [affiliate links] I could find in amongst it all. 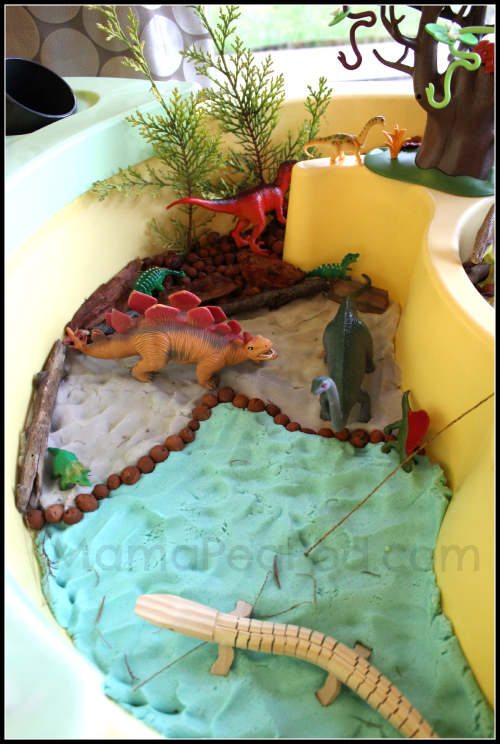 If you have a little dinosaur lover, too, you might also like our Decorated Dinosaur Eggs and our Rainbow Dinosaur Dig! Follow Mama Pea Pod's board Dinosaur Fun on Pinterest.